A superb modern take on the classic Les Paul inspiration. Collect it or play it, it's great for both! A true signature model. Fantastic build quality and playability. Bare Knuckle 'buckers sound the business. Price. Pink binding will deter some. We take a look a signature model that's truly tailored to its namesake, the Knaggs Steve Stevens. What is the signature guitar for? Let's say right from the top that there are other similarly spec'd instruments out there that will offer you more bang for buck from a pure playing and tonal perspective than the guitar you see here. In which case, a signature guitar needs to be about more than just that. At this price, it should offer relative exclusivity, fan appeal, and as a result there should be an element of collectability and intrinsic, long-term value in your investment. "There are to be just 99 models to be had worldwide - this one is number 69"
The Knaggs Steve Stevens model scores on all counts, partly thanks to the celebrated guitarist's legion of fans, and partly because there are to be just 99 models to be had worldwide - this one is number 69. In addition to all of that, it also chucks in an element of benevolent intent as a percentage of the sale proceeds will be donated to the MusiCares charity, an organisation that is dedicated to helping musicians in times of financial, personal or medical crisis. "I've personally seen them help so many gifted players change their lives for the better," comments Stevens. "They are such an amazing organisation." 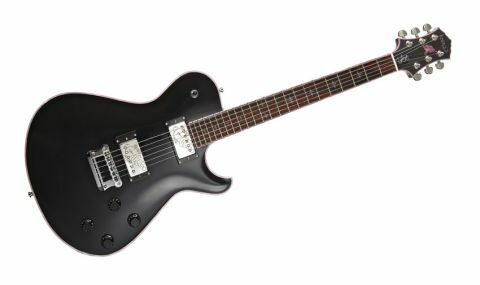 The Steve Stevens model is based on the existing Knaggs Kenai model, itself inspired, of course, by the Gibson Les Paul. What's less obvious is that this guitar's outline is a few millimetres smaller than the Knaggs' 'normal' Kenai, and uses a thicker, more Les Paul- like body depth, too. The maple top is gently carved, while the solid mahogany back is not chambered or weight-relieved (as is the modern Gibson norm). Despite that, it still weighs in under nine pounds (around 4kg) so won't cause too much shoulder fatigue like many modern mahogany/maple guitars can. "The translucent pink binding echoes Stevens' guitars of yore"
The translucent pink binding echoes Stevens' guitars of yore, a complete job to body, fingerboard and headstock that's a fair feat of guitar making craft as it appears to be a fairly brittle material, one that Knaggs sourced via a drum shell company. In any case, it's certainly distinctive, as are Stevens's now customary Ray Gun etchings on the pickup covers (PAF-style customs from Bare Knuckle - DC 8.2K for the bridge and DC 7.3K for the neck, with Alnico IV magnets) and the headstock inlay. In an oft-told story, Stevens used a toy ray gun in the middle and at the end of the solo for Billy Idol's Rebel Yell, held close to the pickups to create a fast stuttering/warbling effect. It's since become his emblem of sorts. The set mahogany neck has what Knaggs calls a special SS neck carve; it measures a shade under 43mm wide at the nut and 21.4mm deep at the 1st fret, a touch under 24mm at the 12th. That's a lovely vintage-style taper and while substantial feeling, there's not too much shoulder in the profile so it will suit anyone who prefers old-style necks rather than modern, flat and wide ones. In fact, it's become something of calling card for Knaggs guitars: every Knaggs neck we've wrung yet has been a belter. The precisely inlaid rosewood 'board, complete with some subtle but beautiful figuring is immaculately presented, as are the 22 jumbo frets: a full 2.85mm wide, plenty of height and not too much crowning and profiling. It's all you can do not to go bend and vibrato crazy as those huge frets somehow draw it all out of you. Whipping out the neck pickup reveals that there's no long-tenon joint as you'd expect of a vintage-style Les Paul. What you'll find is that the neck tenon doesn't extend at all into the neck pickup cavity on Knaggs Kenai Series guitars: it looks more like a regular bolt-on heel, albeit glued in. While we're there, we can see the maple cap is around 12mm thick on the bridge side of the neck pickup cavity. Knaggs' approach to bridges is always interesting and here we have a single tailpiece assembly into which is mounted a TonePros TP6 tune-o-matic- style bridge, with grub screws to lock it to the posts. Stevens says it helps the guitar sound a little clearer and brighter than it otherwise might, were it a standard stop tail/tune-o-matic setup. You also get a useful addition of a chromatic tuner in the pickup ring, made by Shadow: neat and effective. Okay, so we're obviously not expecting this to sound like a Strat. You won't be entirely surprised to hear that the time-proven combination of a single-cutaway mahogany/maple body, set mahogany neck over the classic Gibson scale length and vintage-style humbuckers returns a pretty good impression of a vintage-leaning Les Paul Standard. "It has a clear, yet classic tonality that doesn't suffer the muddy bloat of some Les Paul-type guitars"
We'd played the guitar a lot before talking with Stevens about it, and thankfully our ears heard his hopes: that it's a clear, yet classic tonality that doesn't suffer the muddy bloat of some Les Paul-type guitars, yet still retains a strong, punching midrange for hard-rockin' bark. We'd guess that the guitar's clear and open sound - especially in the middle and neck positions - has a lot to do with the vintage PAF-style Bare Knuckle pickups and that bridge assembly. Huge,modern levels of metal gain aren't really what this guitar is for, but for anything from 'on the edge of break-up' blues, through to modded Marshall-style classic and hard rock, it's a sweet sounding guitar with a singing, vocal quality that's there in the very 'best' older-style Les Pauls. Limited-edition guitars such as this need to be judged on what they are, not what they're not. So, collectable: yes. Distinctive: affirmative. From one of the world's leading custom guitar makers with a stellar track record: absolutely without question. And, oh mama, does it sound like a seriously good, old classic. Whether anyone will drop this kind of money and dare take it to the stage, however, is a more uncomfortable question. A guitar that's this good to play and that sounds this convincing really deserves to spend its life being heard in the hands of a great player such as Stevens or, hey, maybe you. Chances are, though, it'll end up being collected and kid-gloved, which is the purchaser's prerogative. Either way, it's a simply fabulous guitar.